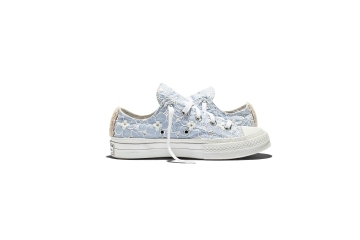 Our favorite iconic All-Star kicks are getting high-fashion upgrade thanks to a recent collab with UK-based label Shrimps. Hannah Weliland, the brands designer, created a custom capsule collection of both high and low-tops Chucks with her trademark quirky aesthetic in faux fur for the spring/summer 2017 presentation at LFW. 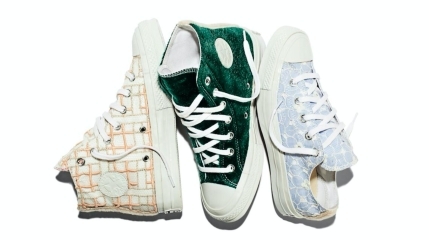 These special customized Chuck Taylor sneakers, each have a unique design like appliqués like leather patches, textured gingham, pinstripe details, all in a mix of soft colors like pale blue, peach, and a stand-out pair in an all-over lush deep green faux fur. 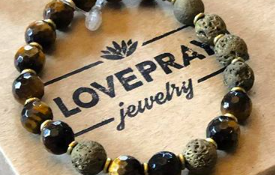 No release date has been confirmed but they will be in our dreams every night until they are stocked in our closet.